Roses are known by everyone in the world, you don’t have to be a gardener to know what a rose bloom looks like. 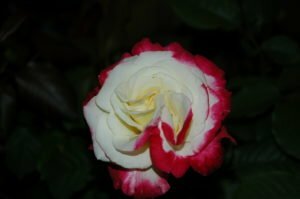 There are many different groups of roses and climate determines which rose plants grow best in which area. 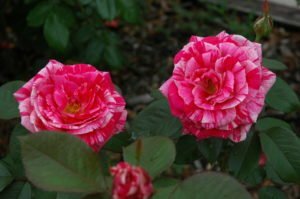 Houston weather can be difficult to grow hybrid teas or moss roses without having to spray constantly for black spot with a fungicide. Black spot fungus thrives with high temperatures and high humidity so finding roses resistant to black spot should be your top priority when selecting rose varieties. When siting a location to grow roses in your home garden, look for an open area in the middle of the yard or a space that get morning sun and evening sun for the best growth and flower production. Do not choose areas against a fence or structure as this reduces the air flow and the amount of strong sunlight the plants receive. (More sun, more flowers) When there is a fence or wall, the plant only receives light from one side, causing phototropism of the plant. (Growing to the light) Reduction of light and air flow encourages pest and disease to set up house as the plants next to a structure form a secure space from wind, rain, and the elements. Roses need a MINIMUM of 6 hours of direct sun, not filtered by trees or buildings. 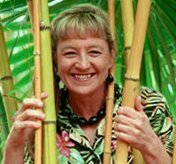 Using a north or eastern exposure can also be a hindrance if there are trees in the neighborhood, across the street or if you back up to a wooded area so don’t just look at your garden space, look around to see what could possibly impact your success with growing roses. Since 1887 W.Kordes Sohne has been breeding roses and is one of the largest rose breeding programs in the world. Now 4th generation KORDES continued goals of breeding are 1) disease resistance against fungal diseases black spot, powdery mildew and downy mildew, 2) Flower quality; long lasting, self-cleaning, rain resistance and fragrance, 3) Vigorous growth habit with good branching. 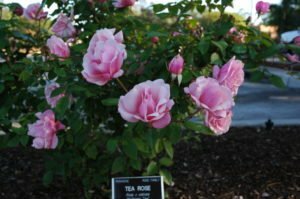 Trialing garden roses takes a minimum of seven years before releasing into the market and it is the strict criteria that makes Kordes a great rose for the Gulf Coast. Kordes roses are available in Hybrid Tea (Single stem single flower), Floribunda (cluster of flowers on one stem) and Climbers. Beverly, Pink Enchantment, and Iceberg are 3 you can find at the Arbor Gate. Old Garden Roses or Antique Roses have been rustled in Texas cemeteries for years. 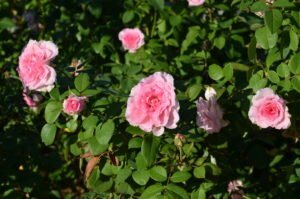 A local group called The Texas Rose Rustlers meet and collect roses growing in cemeteries for propagation as these roses receive virtually no care are vigorous, hardy, and disease resistant. Antique roses or OGR’s are not grafted, they grow on their own roots and many of these are on the Texas A&M Earth-Kind Plant List, such as The Fairy, Ducher, Georgetown Tea and Cecil Brunner (sweetheart rose) to name a few, see complete list: www.earthkindroses.tamu.edu. Drift roses are a low growing landscape rose that grows from 12-30” tall and spreads. This group of roses came from Conrad-Pyle, a breeder who introduced us to the Knock Out Rose which has become a legend in the landscape for disease resistance and continuous flowers. 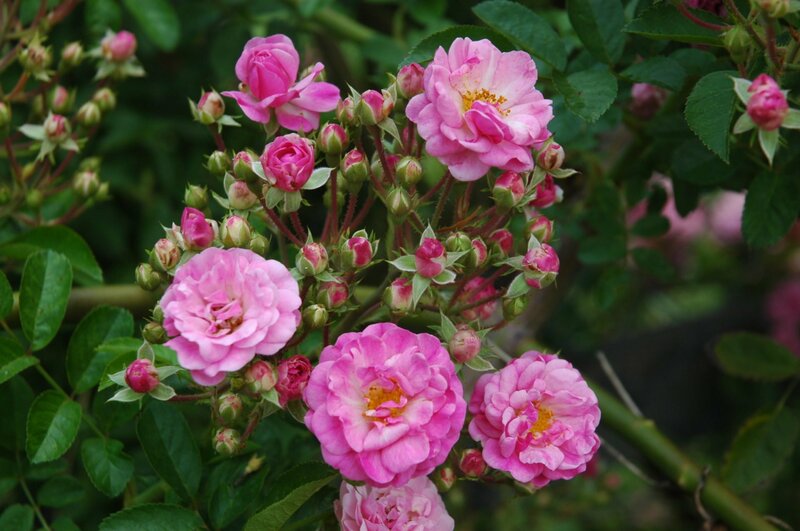 Drift roses do not have fragrance but that is replaced by almost continuous bloom as a landscape rose. As with all plants, it is best to build your flower beds with expanded shale worked deep into the heavy soil along with organic fertilizer and good compost. The shale creates air spaces in the soil for deep rooting and breathing, the organic fertilizer converts a sterile soil by calling soil microbes to help build a healthy, living soil that supports life and growth and the compost is an organic material that acts as the binder for both. HAPPY VALENTINES DAY FROM THE ARBOR GATE!